Welcoming environments support survivor-centered advocacy. 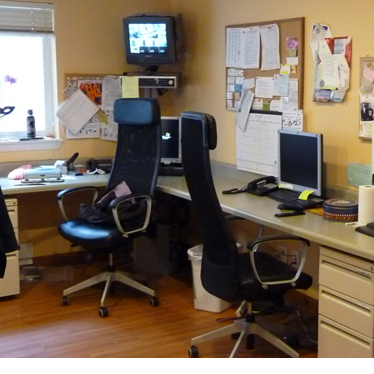 providing similar chairs for advocates and residents, can encourage mutually respectful relationships. Art can also bring beauty and inspire both staff and residents, and communicate cultural inclusion. At the Salvation Army Catherine Booth House advocacy office, desks around the edge of the room ensure that advocates and survivors both have access to computer screens and can work collaboratively; advocates do not sit behind a desk with access to info the survivor can’t see for herself. Advocates can meet resident needs more easily when storage is generous, efficient and conveniently located. Situating a small storage area adjacent to advocates’ offices facilitates easy access to necessities for residents arriving in the middle of the night or with an immediate need. 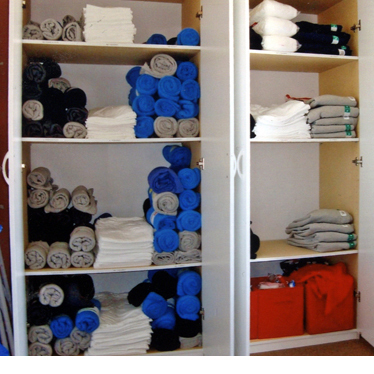 Secondary storage can be replenished from main storage facilities located elsewhere in the building. A small closet with clothing in varied sizes has been located in the staff office for immediate access.